74 loyalty points Your cart will total 74 points that can be converted into a voucher of 2,96 PLN. 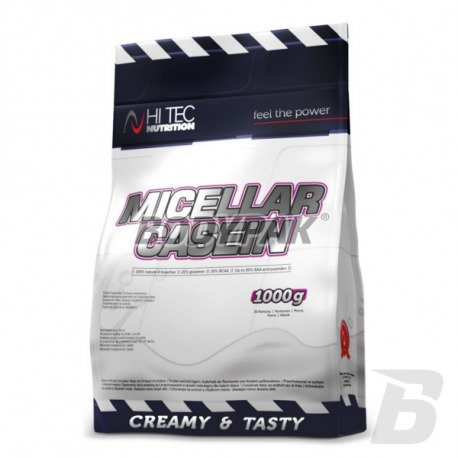 Hi Tec Micellar Casein is a protein which is absorbed slowly and provides many hours of building material supply to the muscles. It works great in conditioner as a "night" because it works even for 7 hours after consumption. Effectively eliminates night catabolism and enables the rapid construction of muscles. Contains 20% glutamine, 20% BCAA, 50% EAA. It is characterized by great taste and creamy consistency. Ingredients: milk protein (97.6% for the vanilla; 92.7% for the chocolate), cocoa (for chocolate flavor), thickener: xanthan gum, acidity regulator: citric acid, sweetener (sodium cyclamate and sodium acharynian), a mix of vitamins (ascorbic acid, niacin (nicotinic acid amide), ethyl DL-alpha-tokofenylu, D-pantetonian calcium, thiamine mononitrate, riboflavin, pyridoxine hydrochloride, D-biotin, pteirolomonoglutaminowy acid, cyanocobalamin ), aroma, anti-caking agent: calcium phosphate. Świetna kazeina, zapycha na noc, idealna pożywka dla mięśni w nocy. Świetny smak, piję z mlekiem (z wodą podejrzewam będzie też świetnie), minusik za małe pienienie się - ale nie przeszkadza w niczym. Cena i jakość idą w parze. Jeden duży minus brak opakowania 2 kg bo warto by było takie mieć. Polecam. Jak dla mnie idealna odżywka białkowa na noc. Bardzo dobrze się rozpuszcza, ma przepyszny smak i zdecydowanie przyspiesza regeneracje mięśni. Zauważyłam jeszcze jeden plus, przy spaniu ok. 9 h nie pojawia się rano głód po nocnym niejedzeniu. Ja wybrałam smak waniliowy - zdecydowanie nie ma chemicznego posmaku jest łagodny i przyjemny. 3 osób uznało tą opinię za pomocną. Superb high-protein nutrient, so that not only will complete the deficiencies of protein in their diet, but also will fulfill their needs organoleptic! It tastes great and easily dissolves. This elite high-protein nutrient guarantees the peak anabolism of muscle proteins through over 5 hours from the time of consumption. 100% Natural Whey Isolate! It contains 100% whey protein isolate having a protein concentration 97%. This makes it the leader in terms of protein content, yet economical! High-quality whey protein isolate that is ideally suited to both shortly after training as well as during the day! Very good solubility and refined taste of each serving. The great advantage is virtually identical to the reference amino acid profile. It supports the development and regeneration of muscle tissue! 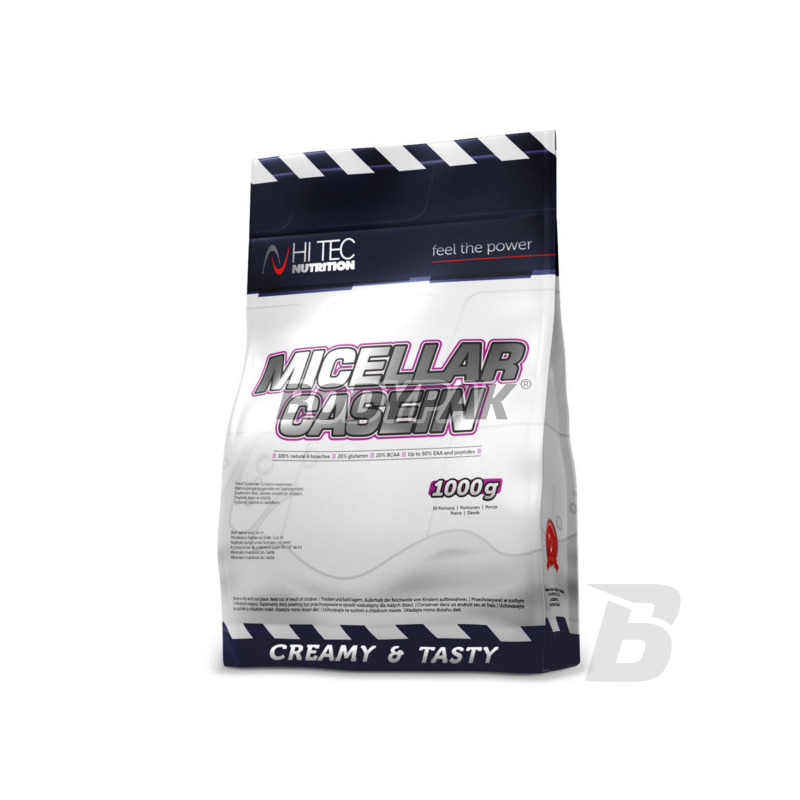 High protein supplement that contains 100% micellar casein, which is the standard source of protein with a favorable, prolonged absorption time. Protect your muscles from catabolism night!